Do you have a question about our wholesale shipping and packing products? Contact us by filling out the contact form below or by calling the number listed above. All fields are optional, but please be sure to include an email address if you require a response. QUOTES: If requesting a quotation or free samples please also be sure to include your zip code as well as the items and quantities needed. 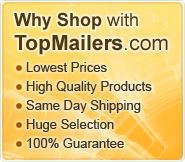 Thanks for shopping at TopMailers.